The LSA will meet concurrently with the American Dialect Society (ADS), American Name Society (ANS), North American Association for the History of the Language Sciences (NAAHoLS), North American Research Network in Historical Sociolinguistics (NARNiHS), Society for Computation in Linguistics (SCiL), Society for Pidgin and Creole Linguistics (SPCL), and the Society for the Study of the Indigenous Languages of the Americas (SSILA). See the New York Times' recommended places to visit in New Orleans. To find out more about having a presence at the LSA Annual Meeting, email David Robinson, Director of Membership and Meetings. Online ordering will be available later this year. Ever wondered what goes in to planning the LSA Annual Meeting? Click here for answers to some FAQs on this topic. Proposals for organized sessions at the 2020 Annual Meeting are being accepted through May 15. Abstracts for 20-minute paper and poster sessions may be submitted online between May 1 and June 24, 2019. Read the Call for Abstracts. The Five-Minute Linguist is a high-profile contest during which selected speakers will be judged on their ability to present their research in a brief but informative way. These five-minute presentations should be lively and engaging, delivered without notes on a stage without a podium, with audiovisual effects of the speaker’s choosing. The talks should be directed to a nonspecialist audience, may come from any subfield of the science, and must display qualities that will attract interdisciplinary interest. Information about Pop-Up Mentoring at the 2020 Annual Meeting will be available later this year. Everyone attending the meeting is expected to register. Compliance is important for keeping our fees affordable. Only those who register will be allowed to present papers, use the Job Placement Service, or attend presentations and other functions. Registrants should wear their meeting badges at all times when at LSA Annual Meeting functions. Preregistration for the 2020 Annual Meeting will be available from September 1 through December 13, 2019. .
Preregistration fees will be available in May 2019. Note that preregistration fees are normally nonrefundable. .
Any attendees who have not preregistered for the Meeting by the December 13 deadline will need to register onsite. Registration fees will be available in May 2019. Local inforimaton will be available in late 2019. For a nominal fee, the LSA provides private space at the Annual Meeting for organizations wishing to interview job candidates or collect CVs from meeting attendees. Read more about the Job Interview Service here. Attendees at the New Orleans meeting who need ASL/English interpretation must notify the LSA Secretariat and register for the meeting by November 15, 2019. Presenters who plan to present in ASL must also notify the Secretariat by that date in order to ensure that interpretation is provided. All requests should be sent to David Robinson, Director of Membership and Meetings, with the words "2020 Meeting ASL Interpreting Request" in the subject line. Please include a list of LSA sessions and/or papers you expect to attend, including plenary addresses, the business meeting, and the Presidential Address. A meeting schedule will be available in fall 2019. All requests will be forwarded to the interpreter coordinator for the New Orleans meeting, who will identify qualified local interpreters, assist with scheduling, and handle day-to-day logistics concerning interpreting. Attendees who will be bringing children to the Annual Meeting should notify David Robinson no later than December 1, 2019 of their intentions. The LSA will make available information about local child care providers and facilitate mutual child care. Annual meeting presenters may be reimbursed up to $100 for child care expenses incurred in conjunction with the Meeting. A Lactation Room will be provided if requested. The Hilton New Orleans Riverside has reserved a block of rooms for those attending the 2020 Annual Meeting. 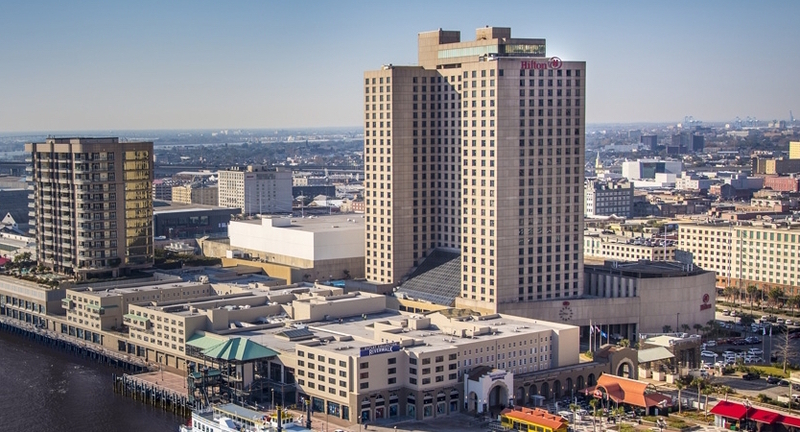 The Hilton is one of New Orleans' largest hotels, and is convenient to public transportation, major landmarks, and the innumerable dining and entertainment options offered by The Big Easy. Read more about why attendees should book with the LSA Room Block for the 2020 Annual Meeting. Deluxe view rooms are available for $10/night in addition to the rates above, and Executive Level rooms for $40/night additional.